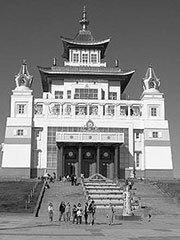 The Kalmyk from the Republic of Kalmykia, south of Volgograd in southern Russia, are the only European people whose official religion is Buddhism. The Kalmyk are a people of Mongol origin who migrated to Europe during the 16th century. Although some of these Kalmyks are now Muslims, most Kalmyks throughout the world remain Tibetan Buddhists. Most Kalmyks regard His Holiness the Dalai Lama as their spiritual leader. Telo Rinpoche is the head of Kalmyk Buddhist Union, which most Buddhists in Kalmykia belong to. There is a Kalmyk Buddhist temple in Belgrade, Serbia, and several Kalmyk Buddhist temples in Monmouth County, New Jersey, where the vast majority of American Kalmyks reside, as well as a Tibetan Buddhist Learning Center and monastaryin Washington County, NJ. Golden Abode of Buddha Shakyamuni is the largest Buddhist temple in Europe, was built in 2005 AD, in Elista, Kalmykia, The place sanctified by the leader of the Buddhists of the world by His Holiness the Dalai Lama XIV.